AND Dog of the Year qualifier... like father like son! Dollar was the first progeny of our Multi BIS/BISS winning dog Richie. He was only steadily shown through his puppy classes and met with some nice success along the way to become an Australian Champion at 10 months old. 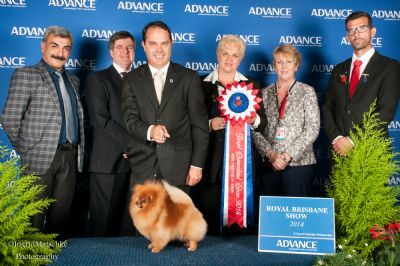 Dollar finished 2012 having had good success at Breed Specialties, Toy Specialties and All Breeds Shows to become the #1 Rising Star Pomeranian in Australia, just as his sire Richie had done in 2011. 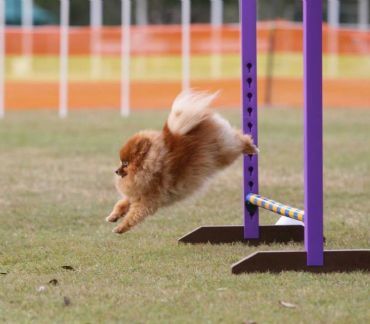 Dollar was neutered after his appearance in the 2013 QLD Dog of the Year Finals and continued his show career during 2014 in Neuter classes winning many Best Neuter in Show awards including at the Royal Brisbane Show and Dogs NSW International Spring Fair. Dollars career has moved on to Obedience/Agility with Selby Wright commencing in August 2014 and we look forward to watching Dollar fulfil his immense potential in performance sports.